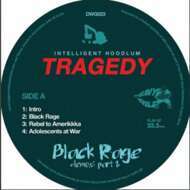 In cooperation with Iller Regime, Diggers With Gratitude released Tragedy's the "Black Rage Demos" in 2010. If you ever expected there must be more or if you like the first release as much as I do you'll be excited to hear that this time Diggers With Gratitude collaborates with Heavy Jewelz to release Pt. 2 of the "Black Rage Demos". These tracks were submitted for the 'Black Rage' album in 1991-92, this album was changed/updated and evolved into 'Saga Of A Hoodlum', released in 1993.